330 pages | 103 B/W Illus. 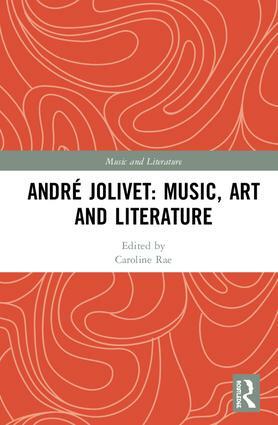 This first book in English on the French composer André Jolivet (1905–1974) investigates his music, life and influence. A pupil of Varèse and colleague of Messiaen in La Jeune France, Jolivet is a major figure in French music of the twentieth century. His music combines innovative language with spirituality, summarised in his self-declared axiom to ‘restore music’s ancient original meaning when it was the magic and incantatory expression of the sacred in human communities’. The book’s contextual introduction is followed by contributions, edited by Caroline Rae, from leading international scholars including the composer’s daughter Christine Jolivet-Erlih. These assess Jolivet’s output and activities from the 1920s through to his last works, exploring creative process, aesthetic, his relationship with the exotic and influences from literature. They also examine, for the first time, the significance of Jolivet’s involvement with the visual arts and his activities as conductor, teacher and critic. A chronology of Jolivet’s life and works with details of first performances provides valuable overview and reference. This fascinating and comprehensive volume is an indispensable source for research into French music and culture of the twentieth century. Peter Hill, University of Sheffield, UK. Barbara L. Kelly, Royal Northern College of Music, UK. Caroline Rae is a Reader in Music at Cardiff University and pianist. She has published widely on twentieth-century French music as well as on the musical writings of Alejo Carpentier, and is author of The Music of Maurice Ohana (Ashgate, 2000), editor of the revised and expanded edition of Robert Sherlaw Johnson’s Messiaen (Omnibus, 2008) and contributing co-editor of Dutilleux at 95 (Contemporary Music Review, 2010). She was Series Advisor to the Philharmonia Orchestra’s landmark festival City of Light: Paris 1900–1950 and has been a programming consultant to the BBC National Orchestra of Wales, projects including BBC Discovering Dutilleux Festival, Jolivet Composer Portrait and Paul Sacher Perspectives season. She is a frequent broadcaster on BBC Radio 3. As a pianist, she was a pupil of Dame Fanny Waterman and Yvonne Loriod-Messiaen and remains active as a performer. She was made a Chevalier de l’Ordre des Arts et des Lettres for her services to French music in 2018. As musicology increasingly embraces interdisciplinary approaches, this series of specially commissioned volumes offers fresh perspectives on composers whose works drew deeply on other artistic mediums, including painting, architecture, poetry and prose. Each volume comprises a series of commissioned essays which explore the musical, artistic and literary inspiration behind a particular composer’s output. Biographical, analytical, historical and contextual studies are drawn together to throw new light on and suggest new ways of understanding these composers and their work.